Visit the blog of artist and designer Allison Haley to learn more about her art workshops, collection releases, special offerings and more. Summer is here and inspiring some epic beach days here in Santa Cruz! I've been painting some little scenes with watercolor and gouache that reflect the feeling I get when I spend a day at the beach: recharged and vibrant! 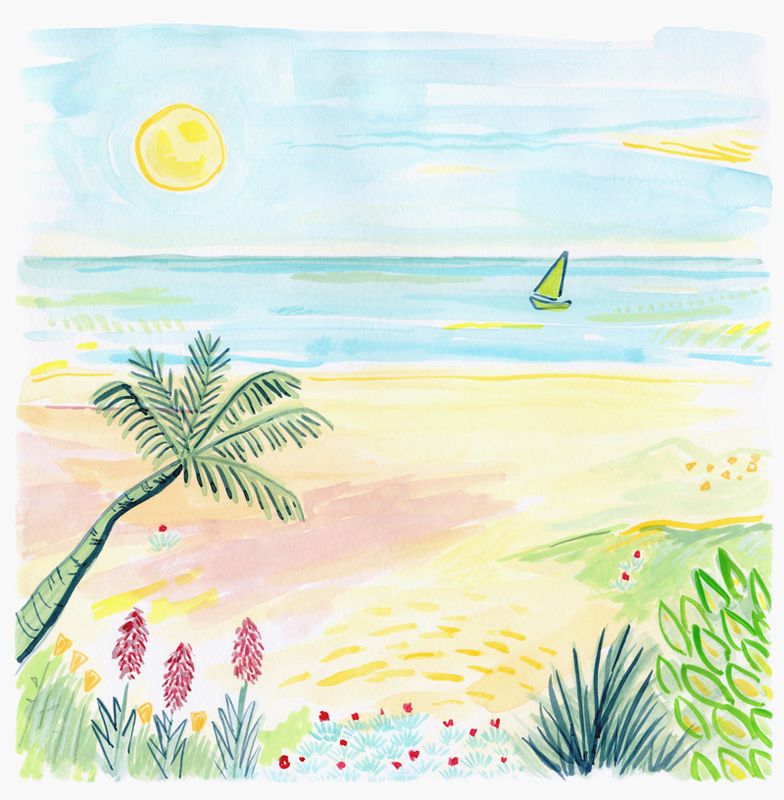 Here is a watercolor & gouache painting I created to put a little summer in your day! Big Sur has seen quite a winter, with landslides and rockslides too numerous to count, and with the closing of Pfieffer Canyon Bridge, I am afraid it may be awhile before people coming from Monterey Bay can access our favorite spots like Nepenthe, Post Ranch, Ventana, Deetjins and Esalen. I painted this while meditating on a quick recovery for the road so that the local economy can be up and running again soon. Marin is dear to my heart as a number of our close family friends live there. We took a trip up in early January to visit our friends in Novato, who have an amazing view of the hills from their home. This painting was inspired by the photo to the right, which I shot in the Golden Hour of the day, just after sunset. To purchase this painting please send me an email through my Contact page. Thanks for looking! Allison Haley is an artist, designer, illustrator, and art teacher from Santa Cruz, California. Her modern landscape paintings and bohemian illustrations are inspired by life in California and the American West. Allison Haley is an artist and designer from Santa Cruz, California. She creates modern landscape paintings and bohemian watercolors inspired by life in California and the American West. She teaches art workshops to all ages, and also works with small businesses to provide graphic design, creative direction, marketing, and event services. Sign up to receive updates, special offers, and freebies! Thank you for signing up for my newsletter! © ALLISON HALEY. ALL RIGHTS RESERVED. You may share images of my artwork with credit. All artwork, content, and images of artwork are the sole property of Allison Haley and may not be used or reproduced for profit without permission.